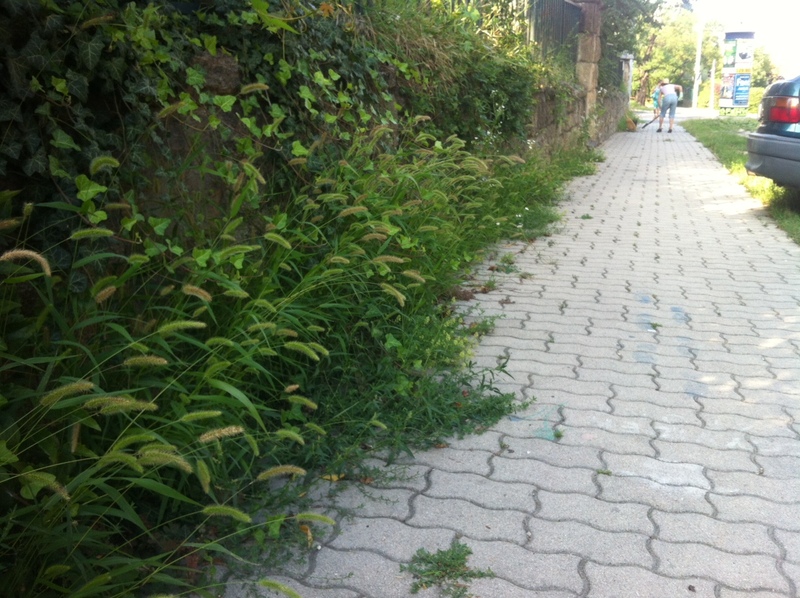 Walking back from the shops this afternoon, down Németvölgyi út in Budapest, I saw a lady pulling up all the grasses, wild carrot, plantain, wood sorrel and other “weeds” lining the edge of the pavement. Since I like lots of wild flowers breaking through pavements and walls, while she clearly preferred the bare, stern stone surface, I thought that we had different views of what is beautiful. So I stopped by her and greeted her. She put down her hoe and stood up. “Isn’t it is pity to kill these plants? Don’t you think they are beautiful?” I ask. I picked the exquisite head of a seeding grass and showed it to her. So I am thinking: How can you love them and also be tearing them up in handfuls? It seems that she has a concept of what is right and proper for a town. A set of rules which determine a well-formed town. One of those rules is that the line between the pavement and the front wall of people’s houses should be straight and not interrupted by plants growing. There should be an appearance of “orderliness”. Unfortunately “weeds” suggest neglect and disorder. By referring to the “impression” of neglect, she implies that what is important is not whether or not the road side is actually neglected, but what people think of the road side. That is, if you deliberately let the plants grow, it would not be neglected, but it would give an impression of neglect. There are two ways around this. First, she could be persuaded not to care about what others think. Second, she could actually inform passers-by that, despite appearances, the roadside is not neglected: the plants are deliberately allowed to flourish. However, neglect is just one aspect. Disorder is the other. Either she or those whose judgment she values consider random green forms as being disorderly and this is important to them. It is odd that disorder in itself should be a problem. After all, the clouds above her are disorderly; so is the pattern of passing cars; the wind is disorderly; the barking of dogs is… she is surrounded by disorder. However, what distinguishes that environmental disorder from the specific disorder of the roadside is that she can control the latter and can be expected to control it. I wonder if she dislikes the disorder per se. Perhaps if I had dug deeper, I might have discovered that she didn’t really mind it. After all, she likes it in the woods, so why not here? I have a hunch that this is more about her impression of what others think of her. I wonder if this is partly about “rule following” – she has set for herself a rule about how the road should look and is now obediently following it. Perhaps it is also about status and connected with her self-confidence. When the weeds have returned, perhaps I will see her again and can pursue this topic further. This is all important because tidiness is an enemy of nature and if we want to encourage nature we must learn to treasure disorder. This entry was posted in Environment, society, politics and economics and tagged behavioural economics, belief economics, Budapest, psychogardener, wild flowers. Bookmark the permalink.